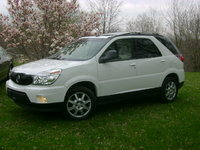 Start a new Buick Rendezvous question. the cooling fans on the radiator are not coming on. what would cause this. how do I fix it? The Rendezvous was introduced in 2002 and is Buick's first foray into the SUV market. Trying to be all things to all people, the Rendezvous is actually more of a crossover SUV in that it blends elements from Buick's luxury sedans with the storage capacity of a minivan and the sportiness of an SUV. It is much more luxury and family-oriented, providing tons of storage compartments and power outlets, along with a low step-in height, and plenty of standard convenient features (OnStar, rear parking sensors), all at a lower cost than most of its competitors. 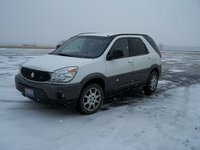 Originally offered in front-wheel and all-wheel drive in base and luxury trims, the Buick Rendezvous featured two V6 engine options, rated at either 196-hp or 242-hp. Both the all-wheel drive and the stronger engine were dropped in 2007. The Rendezvous handled more like a car, which appealed to parents, but it didn't lack for passenger and storage options. Standard with two rows of seats for five, a third row bench was optional, upping the passenger room to seven. Seats could be removed or folded down to increase the cargo capacity. Outside, a sloping rear roof line added a bit of distinctive styling to an otherwise standard SUV shape. The blend of SUV height and versatility with the luxury comfort and ride quality of a sturdy sedan proved to be a successful combination for Buick. The Rendezvous has done well and spawned the mid-size truck-based Rainier a year later. Though sales helped reinvigorate the company, Buick is planning to replace its total SUV lineup, including the Rendezvous, with the 2008 Enclave.